For honest seekers of economic truth, the question about what went wrong that led to the recent great economic collapse has deep roots — but not complicated roots. Our increases in wealth came at the expense of the poor and especially middle class, and they went to the tiny fraction of people at the very top who now own much of your nation. The top quintile excluding the top 1 percent – which is basically the abode of the well-educated who aren’t among the very lucky few – has only kept pace with the overall growth in incomes. Just about all of the redistribution has taken place from the bottom 80 to the top 1 (and we know that most of that has actually gone to the top 0.1). Much of our current difficulty in climbing out of recession can be told from this chart. People who would normally be spending money for food, gasoline, clothing, cars, home repairs and incidentals, simply don’t have the money to spend. Consequently, demand is down. Consequently, the top 1% will not invest their money in the U.S. to meet that non-existent demand. This is the ultimate failure of “supply-side” economics writ large. The very rich can consume only so much. Additional wealth stashed away, even in domestic accounts, will not be spent for more food, or more housing, or more transportation. Even the very rich can eat only so much, travel so much, and few of them behave exactly like Saddam Hussein, with palaces they will never even see. Meanwhile, the bottom 80%, which includes the middle class, lacks money to spend on education, housing, durable goods, and transportation — despite needing more of all of those things. Below the fold, the CBO report’s highlights press release, from the Congressional Budget Office. The top fifth of the population saw a 10-percentage-point increase in their share of after-tax income. Most of that growth went to the top 1 percent of the population. All other groups saw their shares decline by 2 to 3 percentage points. Each source of market income was less evenly distributed in 2007 than in 1979. More concentrated sources of income (such as business income and capital gains) grew faster than less concentrated sources (such as labor income). 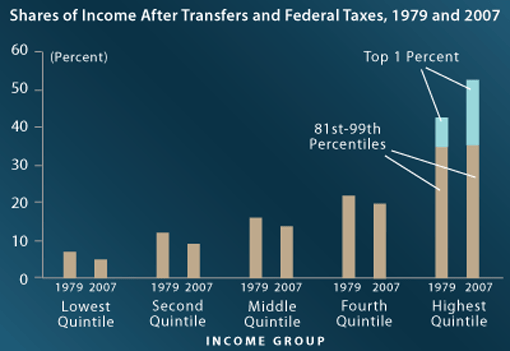 Government transfers and federal taxes both help to even out the income distribution. 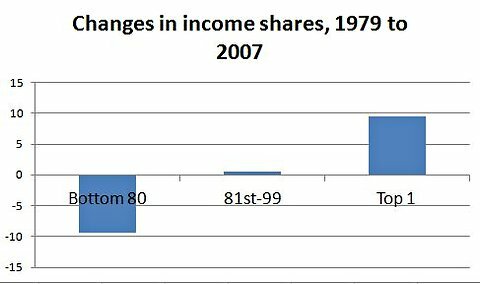 Transfers boost income the most for lower-income households, while taxes claim a larger share of income as people’s income rises. The share of transfer payments to the lowest-income households declined. The overall average federal tax rate fell. Of course, there is even more information in the full report from CBO. More unspun discussion at the CBO blog. This entry was posted on Tuesday, August 14th, 2012 at 2:43 am and is filed under Economics, Free market economics, Freedom - Economic, History, Income Distribution. You can follow any responses to this entry through the RSS 2.0 feed. You can leave a response, or trackback from your own site. You’re right, the evil is the theft. Those who work hard should get the fruits of their labor. We created a tax system that takes fruits from working people and gives it to others. You allege much else that is not in evidence. Quit hallucinating, Mr. Flag. No, sir, your posit is wrong. It matters not one wit how rich your neighbor may or may not be. It matters how rich you are (or not). But what you actually point out is government largess and government corruption – the thing you champion. It is a sin to steal from a man for your benefit – no matter who steals and no matter who you steal from. You weep when the government steals from people to benefit the rich. You cheer when the government steals from the rich to benefit others. Your moral compass is bent. It is irrelevant who is rich and who is not.